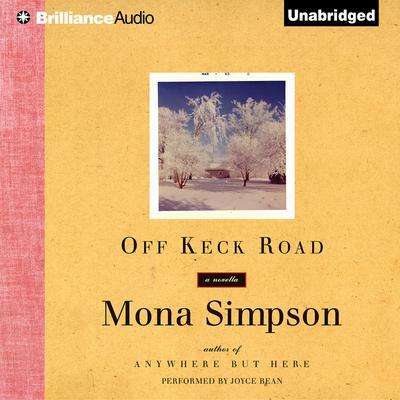 From Anywhere But Here (a first novel that prompted Anne Tyler to proclaim, “She is already a master”) to A Regular Guy (“What a pleasure,” observed Newsweek, “to see a successful novelist take a huge chance and fly high with it”), Mona Simpson has proven herself one of her generation’s defining voices. In each book she has created a memorable cast of searchers who leave home in order to reinvent themselves, to find the missing parent or dream. But in this superb novella – a Pen/Faulkner finalist – Simpson reveals the precise costs and rewards of staying—out of affinity and obligation, out of chance, circumstance, and choice. In Green Bay, Wisconsin — here vividly realized and imagined — Bea Maxwell comes of age in the fifties, and Off Keck Road follows her extended circle along the arc of their lives, through their frustrations and occasional successes, well toward old age. A story of family and friends, of change and many generations, it gathers itself around this remarkable woman, who discovers much about the world from her experience in the one place she has always belonged. Mesmerizing, compact, and intense, Off Keck Road reflects fully half a century of American life — and displays a writer at the maturity of her accomplishment.